RIT welcomed 77 Fulbright scholars from 39 countries to its campus for a Fulbright Gateway Orientation program from July 30 to Aug. 3. 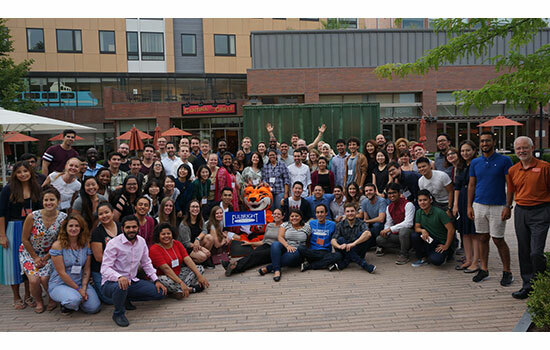 Rochester Institute of Technology welcomed 77 Fulbright scholars from 39 countries to its campus for a Fulbright Gateway Orientation program from July 30 to Aug. 3. RIT was one of eight universities nationwide selected by the Institute for International Education (IIE) to host the program. The Fulbright Gateway Orientation Program is a benefit made available to foreign Fulbright student grantees arriving in the United States. It is intended to address the participants’ roles and responsibilities as Fulbright scholars and develop skills for successful academic and professional lives in the U.S.
During the Gateway Orientation, RIT faculty and staff helped bring the Fulbright scholars up to speed on topics including intercultural communication, American academic culture and U.S. politics. The participants also had an opportunity to explore RIT’s campus and regional attractions such as Niagara Falls and ARTISANworks. The Gateway Orientation at RIT provided the participants with a crucial transition period before embarking on their research, according to Fulbright scholar Iva Nedelcheva, Ph.D. student at Sofia University in Bulgaria. She will serve as a visiting researcher for the next six months at Pratt Institute, focusing on digital storytelling and online news content. Following the Fulbright Gateway Orientation program at RIT, the participants departed for their assignments at universities across the country. This year, RIT will host 22 Fulbright scholars from around the globe. The RIT Fulbright Gateway Orientation was collaboratively organized by the Office of International Education and Global Programs, Office of Graduate and Part Time Enrollment, Office of International Student Services, Multicultural Center for Academic Success, and the Center for Leadership and Civic Engagement. This activity is sponsored by the U.S. Department of State’s Bureau of Educational and Cultural Affairs as part of the Fulbright Program, the U.S. government’s flagship international exchange program supported by the people of the United States and partner countries around the world. For more information, visit http://eca.state.gov/Fulbright.